Are we really becoming more insensitive? I usually have my breakfast at office and the TV in the cafeteria is typically tuned into some news channel. On quite a few days I end up watching “100 tez khabar” or something with a similar name on one of the Hindi news channel. The other day it just hit me that I had been having my bfast without stopping for a moment, without battling an eyelid even when the news was showing stories about some murder and another accident where people lost their lives. I am not proud to say this, but I found that I was very low on compassion for the victims. I just could not relate to their pain. And I was shocked with myself. I am not this insensitive. Then why is it that I am unable to feel the pain of “others”. How do we feel or experience emotions? Over the past few years I have read a few essays and notes from some of the leading thinkers and scientists and it seems that our emotions are trigerred by some bio-chemical process typically initiated by specific glands. This was exactly what they said in Vipassana too. What we feel, how we react is essentially some enzyme secretions. 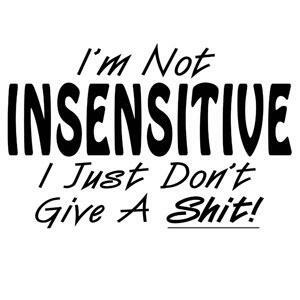 So why are we becoming insensitive? As I looked to connect the dots, I came upon a hypothesis. We are connected to more people now, which means more scenarios for us to have an emotional response. But our body has not evolved to handle this increased emotional stress. Our generation is more connected than ever before. Thanks to Facebook, Mobile phones, Watsapp etc – we have made it easier than before for us to be connected to a larger group of people. We not only get regular updates from close friends and family, but we are also exposed to ups and downs in the lives of our old batchmates, colleagues etc. And this in my opinion is where it all begins. Do you really feel the joy of your school friend’s kid getting his yellow belt in Taekwondo. Maybe you do. How about your ex-colleague’s buying the new iPhone? Or the fact that your neighbor just checked into The Taj in Mumbai. While we are now exposed to more triggers that expect an emotional response, our body’s capacity to handle it has not grown significantly. If all emotionals have their origins in some gland or enzymes, there must be a limit to how much of that enzyme can be secreted. How much load can that gland handle. I am not a biology student but I think such drastic changes in capacity would need a mutation probably. While technology has changed our lives in last 7-8 years, our bodies need much much longer time to re-adjust to the new scenario. So what does the body do if it cannot cope? It tries to choose which ones to react to and which ones to ignore. I am not sure which part of us does this? Is it a rational process driven by some specific areas in our brain? I remember a study by Robin Dunbar where he laid out our social network in the form of 3 concentric circles. The inner most one consisting of close family and friends according to him can have a max of 5 people. The next one made up of people who we want to spend time with is limited to 15 people and so on. Very interesting if you note the limit he places on both the circles. Could it be that this limit is due to our body’s constraint in generating an emotional response. So my hypothesis is that when faced with a tsunami of updates, our body just cannot cope up and the way we adapt to it comes across as insensitive. And if this is true, then one of the biggest negative impact of the social media revolution would be a fundamental erosion in human ties, coz the emotional depth would be missing. I don’t know. But what I have started doing is reducing my exposure to updates (by blocking posts from people whom I can barely remember, by not watching or reading too many news updates, by choosing what I read for most part of the day). For a digital enthusiast like me, this is tough, but I feel it needs to be done. Now.